This scroll is 23 inches long by 11 Inches wide. It was made in the Fukuro Hyougu style with no embellishments of Suji (Horizontal or Vertical cloth lines on the cloth of the scroll). The pale green cloth was to provide symbolic imagery of the duller bamboo color in fall. Bamboo is a favorite subject among Japanese artists due to its versatility in use for building and household utensils and eatery. This work was drawn by Yoshimi Yamada Maples on paper (本紙 honshi). Close examination of the work will reveal that it was drawn quite a while ago, because it is not as bright a white as other scrolls made by Custom Japanese Calligraphy. The paper yellowed and aged with time giving the scroll an older look. Some Hyousoushi use aging techniques to make the scrolls look older than they are in actuality. I do not subscribe to these practices, and would prefer the scrolls to look old through hanging. This scroll is for sale at $65.00 including all shipping and taxes. If you desire us to make a scroll with a different silk or picture paper, please contact to Jonathan at sales@customjapanesecalligraphy.com. The following scroll was made as a gift for a neighbor who helped me with some plumbing work in my house. He is an avid outdoorsman and hunter. So I wanted to use cloth that matched his interests. When I saw this at the store, I knew this would make a beautiful scroll. I put the forest green chumawashi to represent the forest. The character in this scroll will be replaced by a picture that he wants to frame, but the character in this picture is for a variation on beauty. The character actually is composed of the character of Deer in the radical below. I felt this character was very approriate for the scroll being displayed. 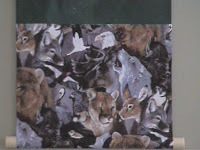 This is a longer scroll about 4.5 feet long by 1 foot wide. This scroll is commissioned and is already sold. For inquiries on designing your own scroll contact Jonathan Maples or go to my webstore. This is a Shikishi Kake Scroll for a bonsai/art lover in Arizona. This cloth with Red and Blue Koi in waves reminiscent of the ukiyo-e or earlier yamato-e style of painting on a blue cloth background. Sorry the picture came out as black cloth, but it is really a navy blue. I wish I had a better camera. 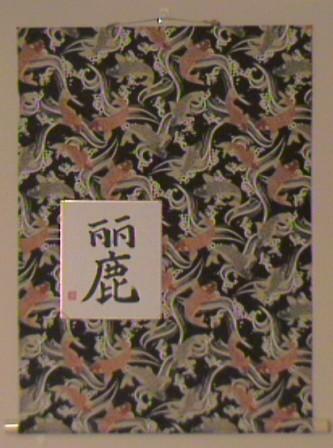 The calligraphy in the middle is written in the Kaisho or block print style by Ryugyoku and is the character Ran for beauty. This customer actually purchased a similar character with an alternate meaning in a semi-cursive style called Shuku. The customer requested the shikishi to hang offset to the left which allows more space to be devoted to the beautiful Koi and the calligraphy to take a less prominent position in the overall work. The scroll includes plastic cream jikusaki with a beige kakehimo. I enjoyed making this piece because the Koi has such a rich history in Japanese Kazari and decoration. Particularly, my family hangs the 'Koi Nobori' (Koi Shaped Windsocks) in honor of boys day and I thank the customer for designing this jointly and giving me such good memories. This Beautiful Scroll was Commissioned and is already Sold. If you would like help to design a personalized scroll for your home, office, dojo or other need with either calligraphy or a sumi-e picture, please contact us at our e-mail or go to our webstore. 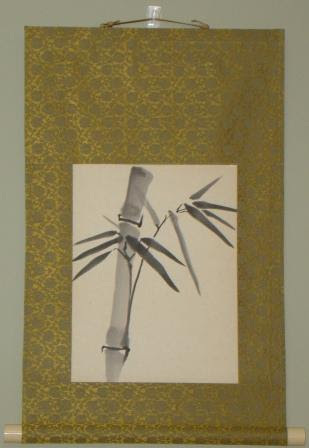 This scroll was designed with the customer at the Golden State Bonsai Federation Convention held in Riverside, California on November 5-8, 2009. The customer wanted a more subdued scroll than the Kachoufuugetsu (Flower, Bird, Wind, and Moon) 花鳥風月 scroll that I had created in my wife's Kaisho style Japanese writing. He thought the cloth, which was a goldenrod to represent the sun was a little garish. This term Kachofuugetsu is a four character idiomatic expression used in Japanese literature to depict the beauty and serenity of the natural world and evokes an apprecation and respect for nature. As a result he picked a beautiful Cocoa shade which would remind one of very rich, fertile soil of our mother earth. He also wished to use a full cursive style. Congratulations go out for being the first customer to select Sousho, sometimes referred to as grass writing, as the preferred style of Japanese Calligraphy. In addition, this customer selected a Dark Blue Kakehimo (Hanging String) which does not make the scroll have any break in continuity when hanging. 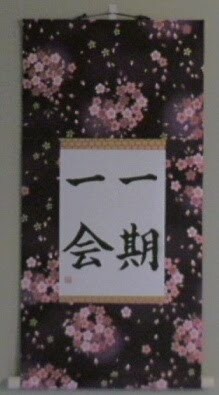 The scroll is stamped with Ryugyoku's Inkan or Hanko (Americans say Chop, but I have never like this word) on both the upper right hand corner and lower left hand corner of the scroll. Perhaps this would allow the bonsai to be displayed on either the left or the right hand side per the rules of Seki Kazari 席飾り. I would need to check with someone more knowledgeable than myself. Finally, the scroll is capped with beautiful stained wood Jikusaki. These pieces add to the scrolls elegance, and allow the colors between the cloth and the Jikusaki to transition very smoothly. This scroll was commissioned and is already sold. If you would like a scroll with the same writing in a different cloth color or different writing style, please contact us at our e-mail or visit our web store. This scroll was designed and written for an Aikido practitioner outside of the United States. The cloth is in a beautiful Navy Blue. Aikido is the Martial Art developed by Morihei Ueshiba, or O-Sensei. It is beautifully written in the block print style called Kaisho by my wife Yoshimi, (Ryugyoku). The Green and Gold of the Ichimonji is a soft transition in regular light, but shines when the flash of the camera was used. The Hanko or Inkan (In English the word used is Chop, but I have never been fond of this word and prefer the Japanese names) is both stamped in the upper right hand side and lower left hand side of the scroll to create a balanced feel between both Hashira or pillars (Side cloth sections of the scroll). This scroll was also ordered with a beautiful Dark and Light Blue glazed Fuchin. This will be the perfect complement to any dojo. The following description of this phrase is translated from Japanese and paraphrased from the book Tango Kogo Jiten published by the Japan Calligraphy Society. Ichigo Ichie is a term associated with tea ceremony, and is said to prepare the heart in meditation for an upcoming tea ceremony (Chaseki). The meaning of this phrase is "During one's life, there is only one chance to meet with another." Even though you may meet tomorrow, it is important to understand the limits of the here and now, because everyone changes from one day to the next. In other words, the moments to moments of our lives are dynamically changing and impacted by our associations. Before the Edo period, the famous Tea Master Sen No Soutan was to meet with an official, Seigan Washou, of the Daitoku Temple. Because Washou did not come at the appointed time of the meeting, Soutan left a note saying that he would come and visit on the following day. After Washou came and saw the note, he wrote a dispatch of his own and sent a servant to deliver the following to Soutan, "My conscience has felt the negligence of my duty to you, so I feel that I can not meet with you tomorrow." Soutan, upon receiving this message felt his own guilt on not waiting to meet Washou and hence returned the messenger to his Master in the temple with a song of apology. This story helps us all to remember that we should treasure each day in the here and now. This beautiful scroll utilizes a dark purple cloth with multicolored cherry blossoms. The Ichimonji was selected because the deep gold color represents value, while the pattern in the ribbon does not compete with the flower pattern in the cloth. This customer also selected a beautiful Purple Kakehimo with gold flecks to complement the colors in the scroll.